India captain Anil Kumble has insisted for the first time that Harbhajan Singh did not make a racist comment towards Andrew Symonds during the second Test. Harbhajan was banned for three matches after being found guilty of calling Australian batsman Symonds a "monkey". It later emerged Kumble asked Aussie skipper Ricky Ponting not to report the incident, but he said: "I offered to apologise only to smooth things over. "I am convinced that a racist remark was neither made nor intended." South Africa batsman Boeta Dippenaar told BBC Sport that Kumble's approach, of trying to deal with the issue between himself and Ponting, was the right way of dealing with the matter. "If there was an issue the players should have gone to each other and said that was wrong and if there wasn't any conclusion it should then have been followed through the proper steps," he said. "It's too easy to say this guy said this so I'm going to report him to the match referee." However, former Australia batsman Justin Langer believes what Ponting did was correct. He told BBC Radio Five Live: "If there was racial discrimination - as there was deemed to be because Harbhajan Singh was given a three-Test ban - that cannot be tolerated." Kumble, though, writing in his column in The Times, claimed relations between the Australian team and his side had become strained because of the hosts' disregard for the spirit of the game. India suspended their tour on Monday following the Harbhajan hearing but agreed to continue on Tuesday, although they warned they might yet abandon the trip if the spinner's appeal fails. 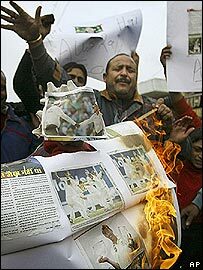 "I asked Harbhajan why he started it but he said he hadn't; Symonds did and goaded him, so he responded," he said. "Ricky, meanwhile, was just not willing to listen, nor see my point. "Furthermore, before the series, Ricky and I decided that in the case of a disputed catch we would take the word of the fielder concerned, if he was certain. "However, Michael Clarke clearly edged to second slip in the second innings and stood there when there was not an iota of doubt over the dismissal and later claimed a catch that showed more than reasonable doubt. "There will obviously be a question mark about that (whether India will take the word of the Australian fielders) in future matches." Harbhajan's charge prompted outrage in India and Kumble said: "In my book, it's really important that when somebody is accused of being a racist the charge is not made lightly, is not followed up just to prove a point and is not deemed as proven unless there is absolute evidence. "Unfortunately this did not happen in Bhajji's case." The ICC hope Harbhajan's appeal will be heard before next week's third Test, with the spinner set to miss the two remaining Tests in Australia, and one further match should it fail. The case will be heard by New Zealand High Court judge Justice John Hansen at a venue still to be determined. Ponting, meanwhile, said he had acted on the guidance of the game's governing body, the International Cricket Council, to report any racial incidents following problems with spectators on Australia's tour of India last year. Match referee Mike Procter said he was satisfied Harbhajan had used the word - though neither of the two umpires heard the remarks - and that "he meant it to offend on the basis of Symonds' race or ethnic origin". India reacted to Harbhajan's ban by lodging their own complaint against Australia's Brad Hogg for allegedly making an abusive comment to one of their players, and he has since been charged by the ICC. Harbhajan is the first player punished for a racist remark since South Africa's Herschelle Gibbs was suspended for three matches in January 2007 after being caught on a stump microphone talking about Pakistan fans.